How to win friends and influence people . . .
No, I’m not Dale Carnegie (1888-1955), the author of How to Win Friends and Influence People, nor am I a reincarnation of Dale Carnegie, nor am I promoting the book or attempting to sell copies. In the interest of full disclosure, I must admit that I have never read the book, but over a period of time approaching eight decades, I’ve developed my own system of winning friends and influencing people. My system is absurdly simple—one needs only to show a genuine interest in another person and the system—my system—will begin to work its magic. For quite a few years now I have spent considerable time in the waiting rooms of chemotherapy units at two major hospitals here in San Antonio, Texas, namely the Brooke Army Medical Center at Fort Sam Houston and the Wilford Hall Medical Center at Lackland Air Force Base. In my experience, most of the people in those waiting rooms tend to draw inward, to retreat into themselves. It’s an understandable characteristic—they are filled with concern for those for whom they wait and their thoughts are of that person, whether for a spouse, a child, a close friend or a casual acquaintance. Most deliberately avoid making eye contact with others in order to maintain their solitude and their thoughts—if eye contact is inadvertently made, most break the contact immediately and return to that solitude, or at best acknowledge the eye contact with a nod—rarely do they speak unless the other person speaks first. They seemingly prefer to read, knit, crochet, write, spend time on cell phones or laptop computers or, in the case of younger persons, hand-held digital games. They sleep or attempt to sleep, or stare at the floor, a wall or the ceiling, and if a window is available they stare at the outside world. Over the years I have initiated conversations with men and women of all ages, and in virtually every instance those people have opened up in varying degrees. Yes, I intrude on their thoughts and on their knitting, their reading, their gazing at something or nothing, and even their attempt to sleep if the opportunity presents itself. By initiating conversations with others I have met some interesting and lovely people, both men and women—young, middle-aged and advanced in years, and I have never been rebuffed. I watched a young woman constructing greeting cards a few weeks before Christmas of last year, apparently oblivious of her surroundings. She had the components in a voluminous handbag, including colored pencils, small black-and-white prints, pre-cut cards and glue. She was coloring the prints and attaching them to the cards. After I observed her actions for awhile, I expressed an interest in her work and we became friends. We shared our stories of family members undergoing chemo treatments, and discussed chemotherapy in some detail—between the two of us we had gleaned at least a conversational knowledge of the process and its successes and failures. She said that she was making Christmas cards for family and friends, something she did every year, and promised to send my family a card. 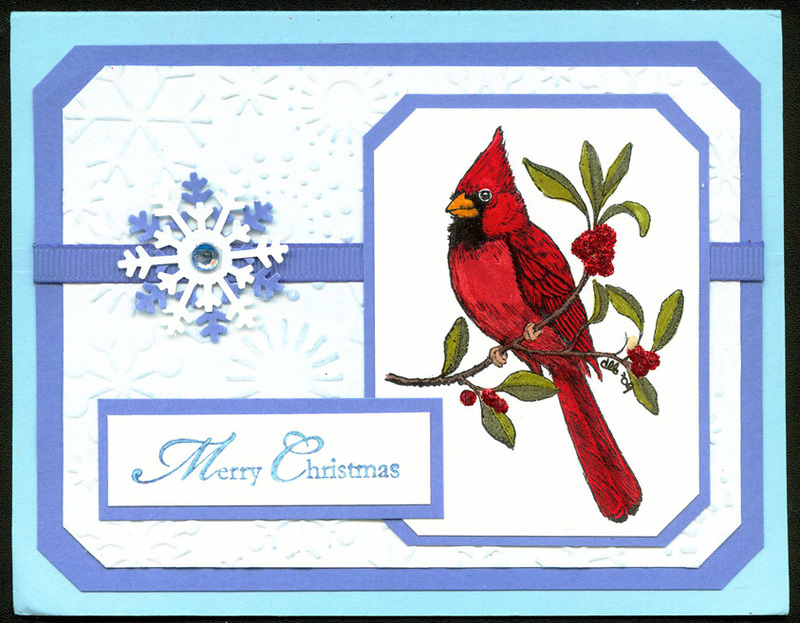 The one pictured below arrived at my home shortly after Christmas of 2009—the cardinal is hand colored, the snowflake is jewel mounted, and the card is layered in six different levels with ribbons and other decorations. It’s a beautiful piece of art, original in almost every respect—I have matted and framed it and will always cherish it—that gift is a beautiful keepsake and a reminder of how to win friends and influence people. On another day in the waiting room at Wilford Hall, I sat next to a lady that was reading a Robert Ludlum novel. The book was a paperback, printed in large type, and the way she held it allowed me to read most of the synopsis on the rear cover. It dealt with a man that was searching desperately for something that did not exist, at least not outwardly—he was searching for himself. I excused myself and told her that she appeared engrossed in the novel, and I asked her if she was a fan of the author. She tilted the book to show me the front cover and said that Ludlum was one of her favorite authors. I asked her if the story involved a man searching for something without knowing that he was searching for himself. She naturally assumed that I had read the book but I told her, truthfully, that I had never even heard of the title. She then asked me how I could know the story without having read the book, and I told her that I had psychic powers and had read her thoughts. Her jaw dropped, her eyes widened and I heard a sharp intake of breath, and I hastened to tell her that I was just joking, that I had read the synopsis on the rear cover of the book. In the long conversation that followed, I learned that she was Hispanic, a native of Mexico and that she believed in mediums and their psychic powers. We parted as newfound friends—I promised that I would not read her thoughts if we should meet again, and she gave me the traditional Spanish blessing of Vaya con Dios, a blessing I have tried to follow since our meeting—and for some years before that, of course. I could ramble on for several reams of paper describing other times that my system of How to win friends and influence people has yielded benefits, but I won’t—I’ll be merciful and close this posting with a word of caution: If you decide to use the psychic powers approach, gauge your audience carefully, tread lightly and be prepared to beat a hasty retreat—as I did with that lady. Try my system—you’ll like it! Excellent posting—you could talk to anyone at anytime about anything. Dale Carnegie would be proud! Hey, I overlooked your comment by several months, but better late than never, right? Thanks for the comment, and I’m glad you feel that Dale Carnegie would be proud of me. Shucks, I know you are proud of me—I’m even proud of me!